Welcome to my latest newsletter to keep you updated on my work in Parliament and around Amber Valley. Brexit has continued to dominate the headlines and parliamentary business, but there has also been some positive news regarding Alfreton Station and a visit from the Secretary of State for Education to a local school. As always, you’ll find a selection of what I’ve been up to over the last few months and details of upcoming events. You’ll also find the usual information about my columns, surgeries and how to contact me. Since my previous Brexit update, on the 15th March, many further votes have taken place in Parliament on Brexit but little has changed from the position I set out 3 weeks ago. There is still no agreement in Parliament on the Prime Minister’s deal, no majority for any other outcome and we are still in the European Union. In that previous update I set out that my support for Brexit had not changed, but that I considered the Prime Minister’s deal was the only realistic way of securing our departure from the EU, predicting that if her deal did not pass neither the House of Commons nor the Prime Minister would let the UK leave the EU without a deal and we would end up with either a very soft Brexit or no Brexit at all. Sadly that is the direction in which we are still heading. I deeply regret that we did not leave the EU on the 29th March. This was a breach of a clear promise we made to the country and betrays the referendum result. After the second defeat of her deal a month ago, the Prime Minister sought and achieved a delay to our departure date to either May 22 if her deal was approved by the 29th March or to April 12th if it wasn’t. This delay was approved by 441 votes to 105 in the Commons. The Prime Minister’s deal was defeated again on the 29th March by 344 votes to 286 and she has set out that she will now seek a further extension from the EU when EU leaders meet tomorrow. In the meantime the House of Commons voted last week to pass legislation requiring her to seek an extension and to rule out leaving without a deal, and last night confirmed this bill. As many of you will have seen in the news, over the last fortnight we have seen the unprecedented takeover of Parliamentary business by opposition MPs supported by some Conservatives in an attempt to force a new Brexit policy upon the Government. This process has led to 2 rounds of indicative votes where MPs could vote for or against a number of options for how Brexit could proceed ranging from leaving without a deal to remaining in the EU, from a 2nd referendum to various forms of soft Brexit. All of these were defeated in the House of Commons. I have set out below how I voted on each option. We are clearly in a mess. In all likelihood we’re facing a long extension of 9 months or 21 months. The only way to avoid this is if the Prime Minister manages to reach an agreement with the Leader of the Opposition and both whip their parties to deliver it in the House of Commons. It might then be possible to leave by May 22nd – but this would very likely be for a very soft Brexit with us remaining in the Customs Union and having to follow all EU rules, effectively giving the EU the right to dictate laws to us and set our trade policy, with us having no say over either. This would not be a Brexit in any recognisable form. There may even be a requirement for a 2nd referendum to achieve even this minimal departure. I wish I could provide a more positive outlook on where events will end up. I doubt a deal will be done with Mr Corbyn or that a stable majority could be found in the House of Commons to deliver the meaningful vote and the many days of legislation that would have to follow. So most likely we are facing a long extension on whatever terms the EU will offer. I will keep arguing and voting for a real Brexit – preferably with a deal – but on a no deal basis if we have to, but I fear unless my colleagues decide to support the Prime Minister’s deal at this very late stage, we face either Brexit in name only or no Brexit at all. The full details of these votes can be found on the CommonsVotes App or on the Parliament website. Revoke Article 50 – it would be absolutely unacceptable for Parliament to cancel Brexit when the decision to leave was taken by the people of the UK in a referendum. I cannot see any justification for this and doubt very strongly that Parliament would ever vote for this without a 2nd referendum. A 2nd or confirmatory referendum – as I’ve explained previously, Parliament’s job is to implement the decision taken in the referendum and then reiterated in both the Conservative and Labour manifestos for the 2017 General Election. A 2ndreferendum is unlikely to give a clear result that would resolve the issue, would be extremely divisive and be seen as a betrayal of the original decision. As we still don’t know what the future relationship with the EU will look like people would be no clearer what the final destination is than they were in 2016. I could also not accept the idea that the response to a majority vote for leave should be to give people a 2nd choice between remaining completely or some half in, half out Brexit – one option in any such referendum would have to be a full departure from the EU. I will therefore not be supporting another referendum. Just get out on April 12th – I remain of the view that leaving with a good deal is the best outcome but if no deal acceptable to Parliament can be found then I would support leaving without a deal. Our preparations have been made, as have the EU’s and while no-one should pretend there would be not be some serious issues to resolve, these could be dealt with. However there is no prospect that the Prime Minister or Parliament will agree to a departure without a deal on Friday and so it is, I’m afraid, inevitable that the departure date will be extended. I know that many constituents understandably have questions and concerns about our upcoming exit from the EU, and the different plans for the various exits. So, I recently organised a Brexit residents’ meeting in Ripley to discuss what’s been happening in Parliament and debate the various options going forward. Thank you to everyone who attended, and I hope to organise another meeting soon – please do get in touch if you’d like to be kept updated on this. I’m pleased that funding for the installation of step-free access at Alfreton Station was confirmed last week as part of a further £300 million investment in the Access for All programme. I know that the works for step-free access at Alfreton are long-awaited and overdue, so I’m pleased the funding has been confirmed for the Station, and I’ll push for the works to start as soon as possible. 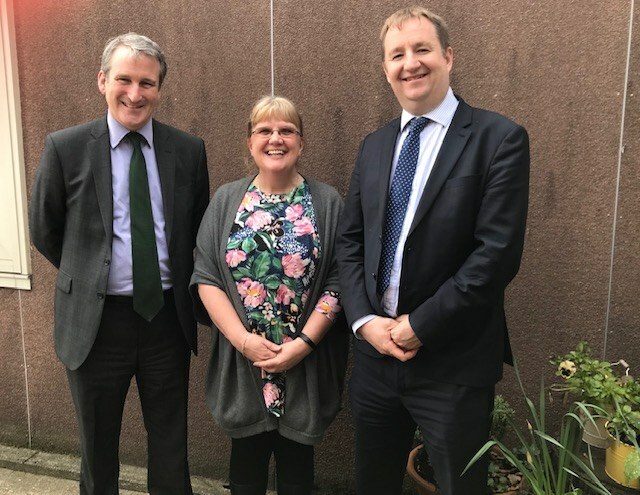 We recently welcomed the Secretary of State for Education, the Rt Hon Damian Hinds MP, to Alfreton Park Community Special School. It was a great opportunity to meet with the headteacher, Cheryl Smart, and children to see the fantastic work the school does and learn more about the plans for the rebuilding of the school. Many constituents have recently contacted me for an update on the Borough Council’s ongoing Green Belt Review, as part of the progression of the Local Plan and a sustainable future housing supply for our area. As many constituents will be aware, I’ve long stated a commitment to protecting our Green Belt land except in the most exceptional circumstances. The public consultation on the proposals has now opened, and I’ll be highlighting my concerns over the proposals as part of the consultation over the next few weeks. You can follow the Green Belt Review and Local Plan progress, and respond to the consultation, here. As always, if there are any street repairs in your area, such as potholes, pavement repairs or broken street lights, you can report these issues and concerns to me quickly and easily here so I can ask for the repairs to be investigated and addressed. I regularly hold surgeries to give you the opportunity to meet with me and discuss any concerns or problems you may have. These are held on Friday evenings between 5pm and 7pm. Please contact my office on 01773 744341 to book an appointment for any of the above, or to arrange an alternative meeting. As your MP, I am able to book tours of the Houses of Parliament and arrange public gallery tickets for constituents. If you would be interested in having a tour of Parliament or arranging public gallery tickets to sit in on the business of the House or Prime Minister’s Questions, please do get in touch. As always, you can contact me by hitting the ‘reply’ button on this email, or you can ring my office on 01773 744341. You can also follow me on Twitter @NigelMills and like me on Facebook here to stay up to date with news and events in Amber Valley throughout the month. Promoted by Nigel Mills MP, of Unicorn House, Wellington Street, Ripley, Derbyshire, DE5 3EH. You’re receiving this newsletter because you subscribed to my mailing list. Would you like to unsubscribe? Unsubscribe from this Newsletter here. nigel.mills.mp@parliament.uk, or via telephone on 01773 744 341. You can also find details of my upcoming surgeries here. You can like my Facebook page here, or follow me on Twitter here. You can also subscribe to my monthly newsletter here to get regular updates on what I've been doing in Parliament and in the constituency. This web site is funded by me personally and not part of the MPs' expenses scheme. This web site is proudly powered by LDD Campaigns.